A few weeks ago I posted an earlier article titled ‘The Wheels of Progress’ and included in this post was a section of a map showing the Borough of Walsall from 1814. This map section has now found its way onto the Facebook pages of Walsall Past and Present with no explanation as to its meaning, it is described to readers as being an 1814 map of Walsall and not part of a map of Walsall. To clarify matters I decided to attempt an explanation. The post is titled The Borough of Walsall 1814….200 years ago, I just hope it doesn’t turn out to be a cure for insomnia, if it is a recipe for a good nights sleep I apologise……and pleasant dreams. 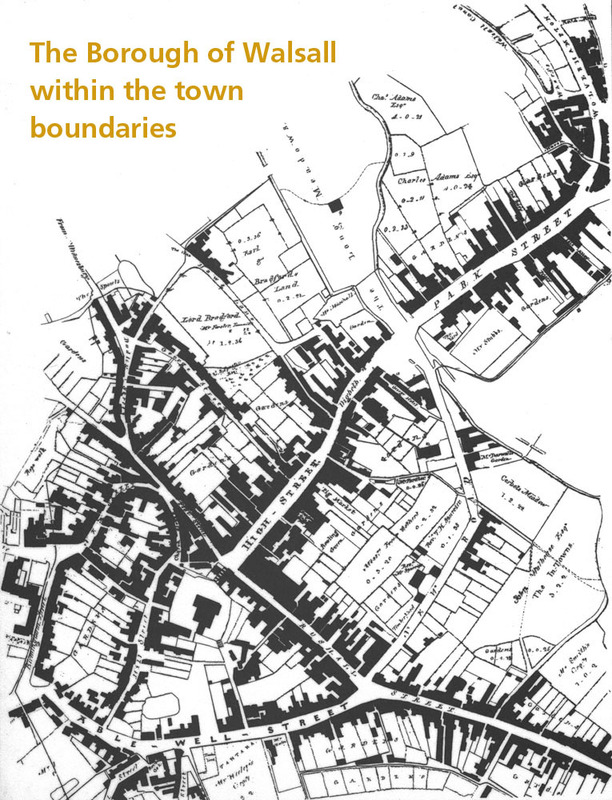 This map shows the perimeters, or boundaries, of the Borough of Walsall, anything outside of these boundaries is known as the Foreign of Walsall. I used it in a previous post to show where ‘New Road’ was situated, a street now known to us all as Bridge Street. The full map which I have included here had initial letters showing various points around the perimeter describing what buildings or landmarks were there and who occupied or owned them. To make things clearer, I have substituted the original initials on the map with the red numbers for clarity, a description then follows. The map along with the text description is available for viewing at Walsall Local History Centre even though the original is actually stamped with the Birmingham Libraries stamp. The boundary begins at point 1 and cuts across Field Gate and proceeds down Birmingham Street. Occupiers of the properties around this first point are, Thomas Wilcox, a plater of New Street, the Widow Tittensor’s dwelling that is occupied by Thomas Thacker. Proceeding down Birmingham Street point 2 is reached and described as Birmingham and Walsall Turnpike Road, on turning left, the yard, warehouse and garden of William Spurrier is passed, continuing down this route one approaches the croft and field of Charles Adams, passing a pond at the end of the field, by a brick wall is point number 3. Turning left at this point, a watercourse flows on your left and between the buildings known as Latchford’s Buildings. At this point there were several dwellings one occupied by Henry Saunders and a manufactory once known as Heptenstalls but now known as Parker’s File Manufactory. Proceeding along this line of buildings point 4 is reached where a right turn is made and the boundary continues at the rear of the premises occupied by Joseph Middleton, the Royal Oak (a Royal Oak still occupies the site today), point 5. The boundary continues at the back of a house occupied by a Mrs Bridget Harvey, it crosses Bank Street and then turns right and runs up the middle of Bott Lane until it reaches point 7 at the wonderfully named Tantarra Gardens on the left and the equally exotically titled Paddock Gardens on the right. A left turn at point 8 meets Paddock Lane where a right turn is made along what is called a foot road which is Balls Hills, it continues along, curving to the right, until Gnosall or Holtsill Lane is crossed with the lime master Joseph Griffin’s house and buildings on the right. The foot road continues past buildings known as the Dog Kennel (this housed the hounds for the hunt) to point 9 on Limepit Hills so-called possibly because of Mr Griffin’s excavations! Before passing the house of John Walhouse the weighing machine is to be found on the left side of the road. A short distance further Rushall Street is crossed where the boundary continues along a watercourse and by the side of the gardens of William Nicholls, at the end of this garden the boundary turns sharp left and its line is determined by the stream known as the Old Brook. This stream continues over a small bridge and then meets up with another watercourse known as Hammerwich Brook, shortly after this union of streams a wall is seen where the streams separate once more. On the left of the wall and stream is Charles Fosters land known as Corbets Meadow, the boundary continues up to the Bridge Meadow, turning right onto a road by the side of some wooden palings and then over a wooden foot-bridge by the tan-yard of Joseph Haden. Following a brick wall point 10 is reached and was known as Mrs Elwell’s Croft. On the left of the boundary, within the Borough, is the house occupied by Mrs. Elwell but owned by Samuel Sharratt, a name well-known in the town at this time. After passing Idle Alley and then the pallisades which divide Sharratt’s Croft from gardens at point 11 the boundary takes a sharp left past a house occupied by Jonathan Perry. The building marked ‘Greens’ was the premises known as Green’s Lodging House. At point 12 the boundary meets another turnpike at the road to Stafford, passing this it goes down the wonderfully named road, Rosemary Alley and across another turnpike road to Wolverhampton. The boundary then runs down the middle of Marsh Lane to what is described as a wooden gig-house occupied by [another] Mrs Elwell, passing this, point 13 is reached which runs along a brick wall to point 14, this area was known as Bottle Croft which was at the end of gardens occupied by Stephen Barber. Point 14 is described as ‘near to a small plantation or shrubbery and croft’ occupied by John Adams, at this point the boundary turns sharp right up to point 15 where John Adams premises ends. Proceeding to point 16 one goes through a brick arch which then opens into a ditch in a field and croft occupied by Charles Adams, following the ditch another property occupied by Adams is reached at point 17. After this point the boundary forms a ‘U’ shape, points 18, 19 and 20 around The Long Meadows (the racecourse) which is determined by the watercourses shown in blue on the map. 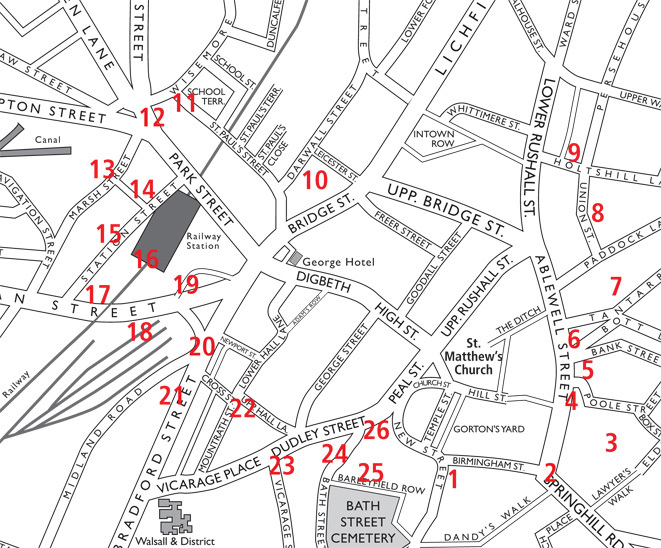 At point 20 is Stubb’s Summer House….yes you did read that correctly, at which point the boundary turns at right angles by Pitman’s Skin House occupied by James Pitman a fellmonger (a dealer in hides and skins). Following the boundary along the brook to point 21 where Twig Yard is reached, a right angle turn takes the boundary past the Vine Inn on the left with Pool Fields on the right. Proceeding along Haws Lane to point 22 a dwelling house occupied by John Morris is reached and at this point the boundary takes a sharp right turn past a pool in Pool Fields and a stable occupied by a man named Marshall. Crossing the turnpike road to Wednesbury at a place known as The Spouts a brick wall was seen which led down to point 23. At this point the boundary takes a sharp left past premises occupied by Thomas Carter, a carpenter, the saddler’s ironmonger, Samuel Fletcher, Thomas Cowley a brass coach founder. Proceeding down to point 24 past the premises occupied by John Unett and Elizabeth Touse, Caldmoor Road (note spelling) is reached. At this point are two dwelling houses occupied by the Widow Hallsworth and James Hallsworth, a ropemaker, continuing along to point 25, along the line of a hedge and past Widow Carless’s house a piece of land is passed called Hallsworth Rope Walk, entered through a wicket-gate. With the journey around the Borough almost complete, the final leg passes buildings occupied by a man named Walton and then returns to the premises of Thomas Wilcox. This map is based on a 1901 map of Walsall and it shows approximately where the same points would be on a map with more familiar sounding street names. This map from 1813 shows the town itself within the Borough boundary. 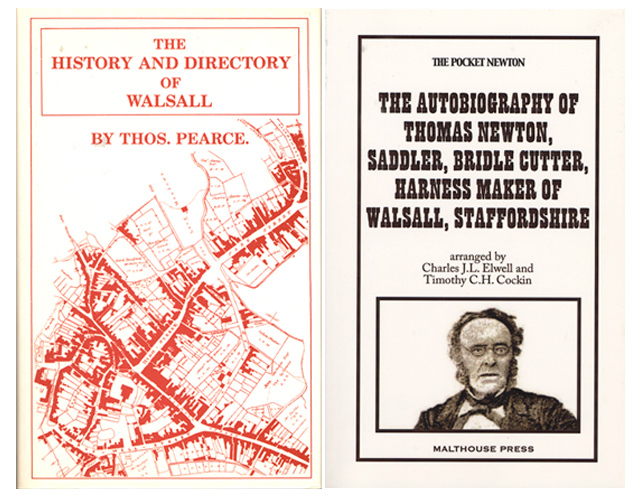 To read more about what Walsall was like around this time the two books whose covers are shown make excellent reading. Both were used in compiling this post and are highly recommended. The Thomas Pearce Directory from 1813 is now unfortunately out of print but a copy is held at Walsall Local History Centre in Essex Street. This facsimile of the 1813 original was printed by Walsall LHC in 1989, ISBN 0 946652 17 1. The book about Thomas Newton (1810-1889) I think is still available and gives an excellent account of living and growing up in Walsall two-hundred years ago. It was published in 2008 by Malthouse Press, ISBN 978-0-9539018-3-8. 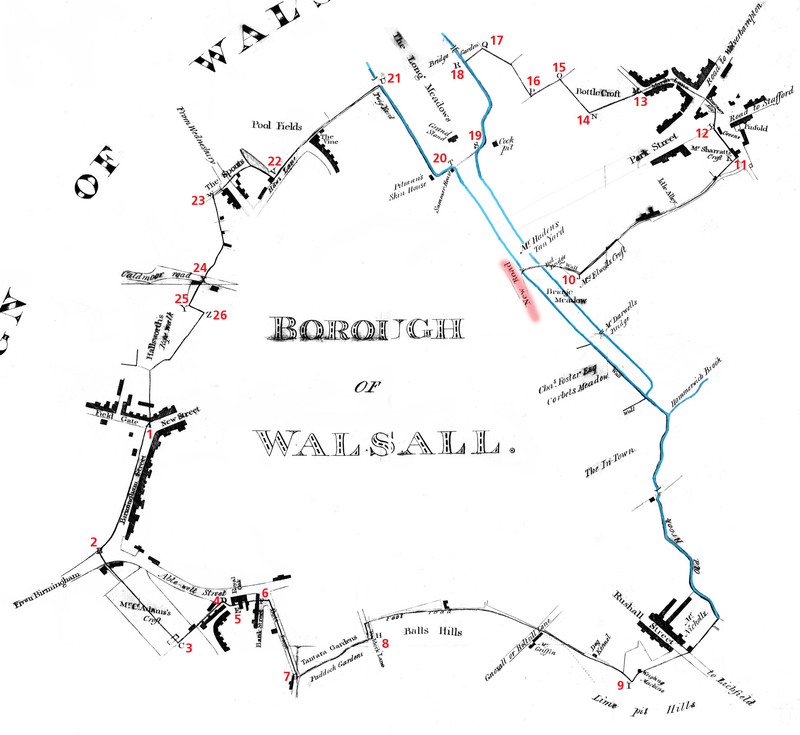 You are currently reading The Borough of Walsall 1814…200 years ago at Walsall Life.